Magic can be a mechanical pursuit with the practitioner learning secrets and mechanisms to perform effects; but the heart of magic is showmanship. 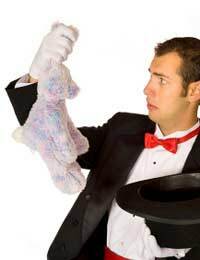 Without showmanship a magician is simply "doing tricks", but with showmanship a magician is performing wonders. Two magicians are performing down the street from each other, each with an equal number of spectators. Over time the group of spectators in front of one magician seems to dwindle while the other grows, leaving the first magician scratching his head, wondering what he did wrong. When all other things are equal (skill, hygiene, routine selection) showmanship will win over the crowds every time. The key to winning performances is showmanship, and the key to showmanship is practice and observation. There are many ways to build an understanding of showmanship, but the best is to observe it first hand. In addition to whatever you need to perform your routine, a notebook and video recorder will go along way to giving you the feedback you need to build your showmanship. Take the time to think about the magicians you enjoy watching, and ask yourself why. Don't settle for a trite, general answer like "because they have showmanship" but try to get into the specifics; WHAT do they do that is showmanship, and WHY does it work? Then go and see these magicians perform with these questions and answers in mind to learn. There are a number of steps you can do to increase both your understanding of showmanship and to elevate the showmanship you use in performing your magic. 1)	Define Showmanship: Don't just use the term "showmanship" without really knowing what it means to you. Is it when David Copperfield arches an eyebrow after a slightly risque comment? How about when David Blaine stares blankly at the camera after pulling a thread he swallowed out of his skin, as if challenging you to wonder if you just saw an illusion or not. It could even be the over the top grinning and wildly swinging arms of a speedy stage magician whipping the cloth away from his vanished assistant. All of these are forms of showmanship… but what applies to you and your routine? 2)	Fake it Till you Make it: This expression works in a lot of ways. Don't have the confidence to ask a girl out? Act like you do and she likely won't be able to tell the difference, and the end result is the same - you asked the girl out. The same thing applies to using showmanship. Not sure if what you are doing has the right amount of punch? Fake it. Do it anyway, odds are the audience won't be able to tell that you are faking your confidence. Go through the motions at least, and the confidence will come. 3)	Don't Keep Faking It: This is the caveat to number Two above. The audience might not be able to tell AT FIRST, but if all you ever do is go through the motions of showmanship it will ring false over time. Fake it until you make it, yes, but you have to eventually make it. This means that you can not stop analysing your routine and everything you do that is meant to be showmanship. It is an ongoing process of perfecting your overall presentation. Showmanship means you care. If you don't care how your audience sees you and your routine, if they are just meant to be a receptacle for your display of magical knowledge, then you are acting as a hobbyist and not a magician.